We are incredibly grateful for the support we have already received from our generous funding bodies, and individuals. There are several ways you too can support Turners House, and help sustain its future as an important heritage site and visitor attraction. The Friends of Turner’s House was set up in 2004 to support Professor Livermore (the last resident) in his aim to preserve the house for the nation, and now supports the aims of the Turner’s House Trust to restore and conserve Sandycombe Lodge. Two Turner related talks a year in spring and autumn. Entrance for these talks is £1 or £6 for guests. Speakers are experts in their field. Two social events a year (summer and winter parties), held at York House, Twickenham (ticketed event). We always welcome new Friends to support our work and participate in our activities, so if you would like to join (or renew) please complete this application form (see below) (or pick one up when you visit the House). The Friends of Turner’s House organise a programme of events which take place throughout the year, both locally and further afield. We hold talks and arrange visits to galleries to deepen our understanding of Turner, his times and his art, and there are social gatherings where Friends can meet. The Friends have run several art competitions for local schools and colleges and we will be continuing with this programme for 2019. Recent activities for the Friends have included a visit to Pitzhanger Manor, Sir John Soane’s newly restored house in Ealing, London. (A second visit is anticipated in May). For the annual Spring lecture in March, the Friends welcomed Nick Powell, Secretary of the Turner Society, who gave a fascinating lecture on ‘Turner’s Titles’. Events are published in regular newsletters which are emailed to all Friends. These newsletters provide further information on how to book. 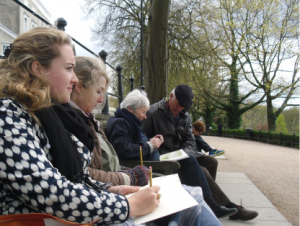 For our celebration of Turner’s birthday this year we are arranging a Sketching Picnic on Richmond Hill. There is no charge for this event, but Friends can book a place by contacting friends@turnershouse.org.uk. The Friends’ Annual General Meeting will be held on Wednesday 12th June at 6.00pm. It will take place in the Hyde Room at York House, Twickenham and will be followed by the summer party which will commence at 6.30pm in the salon. Papers will be sent out to Friends nearer the time. We are pleased to announce the creation of our Supporters’ Circle. In common with many independent historic properties (particularly small ones), our revenue from visitors only provides a small part of the income needed to open the house. The Supporters’ Circle is open to everyone and will have three tiers of membership. Each type of membership will have benefits including free admission to Turner’s House during the open season. Supporters will also be integral to ensuring we can continue our work to establish Turners’ House as an inspiring learning resource for people of all ages. A complimentary DVD copy of our documentary, ‘Saving J.M.W, Turner’s House in Twickenham’ telling the story of the restoration. 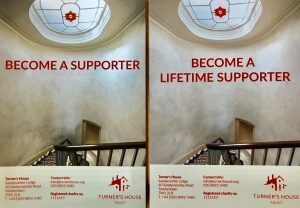 If you are interested in joining the Supporter’s Circle please email Ricky Pound at housedirector@turnershouse.org for further information and an application form. Donations, however large or small, will be gratefully received and used carefully. Please let us know if you are happy for your name to be listed as a donor or if you would prefer not to. Sandycombe Lodge, 40 Sandycoombe Road, Twickenham TW1 2LR. Please join our mailing list to receive our bi-monthly newsletter which includes news from Turner’s House and Friends of Turner’s House, plus special events. The link is located bottom right of each Turner’s House web page.